I just came back from trade joes and costco. I spend 3 hours walking around and looking at every single item. I really miss you. I still haven't made any friends as obsessed with GOOD food as you. I made ribs in a crock pot with butternut squash. I think you would of appreciated it. ephraim raved about your bi bim bap. i think he was disappointed to come home to hot dogs and saimin. oh well. maybe you could be a food critic. I actually found a way to make it without buying the weird vegetables (true, it's different than usual) from the Korean grocery. I'll send you the recipe, 'cause it's VERY easy. 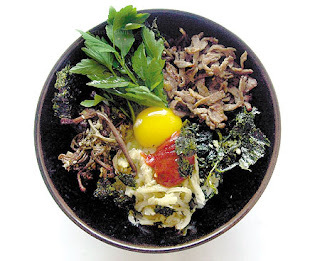 i am a huge bibimbap fan also. i have yet to attempt it at home, but some korean girls that went to the english school i worked at showed me how and it looked pretty easy. but we have two good korean places within walking distance from us, so that makes me not as motivated. that picture is really pretty also.